1. Place cranberry juice and dried cranberries in a small pot and bring to a boil. Remove from heat and allow it to cool. Stir in vinegar and Dijon mustard. Gradually whisk in canola oil so that the mixture becomes a dressing. Season with salt and pepper, to taste. 2. Rinse spinach and frisée; spin dry. Remove thick stems and cut larger leaves into bite-size pieces. Add avocado and onion slices. 3. 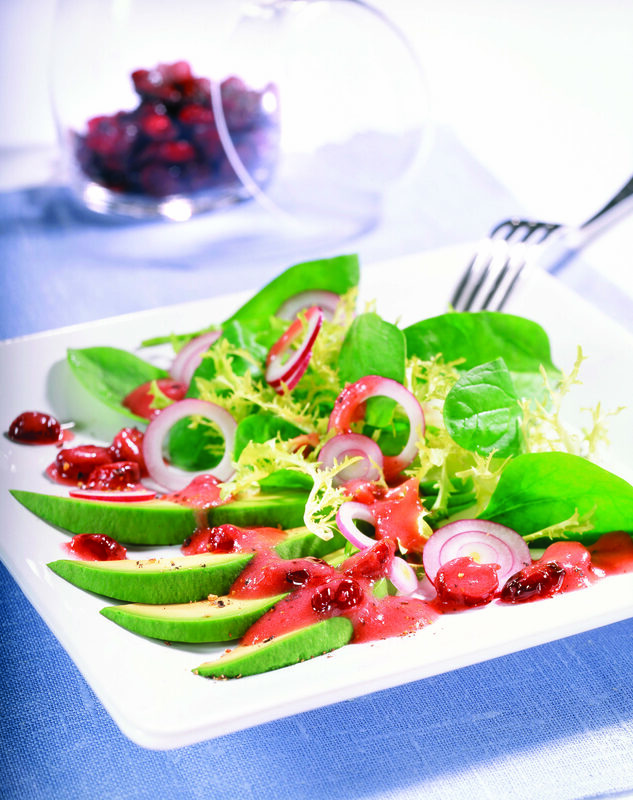 Gently toss salad ingredients with the dressing and serve. Tip: If preparing in advance, sprinkle avocado slices with lemon juice to prevent discoloration. Mix the salad ingredients with the dressing just before serving to keep the leaves fresh and crisp. Recipe and photo courtesy of U.S. Cranberry Marketing Committee. We featured this recipe in the June|July 2015 issue of Wisconsin Farm Bureau Federation’s Rural Route.